Set in 40 hectares of a natural reserve in an alpine landscape in Merano, Italy, Hotel San Luis may be the ideal retreat for those who love nature and quiet getaways. The hotel is the brainchild of Alex and Claudia Meister, who represent the fourth generation of the family running Hotel Irma in South Tyrol. Designed as a private retreat which connects guests to nature, San Luis Hotel features a simple, pared-down aesthetic and large windows opening towards the breathtaking landscape. The design takes inspiration from vernacular architecture, but also adds modern accents, evident in the striking glazed facade of the common building. 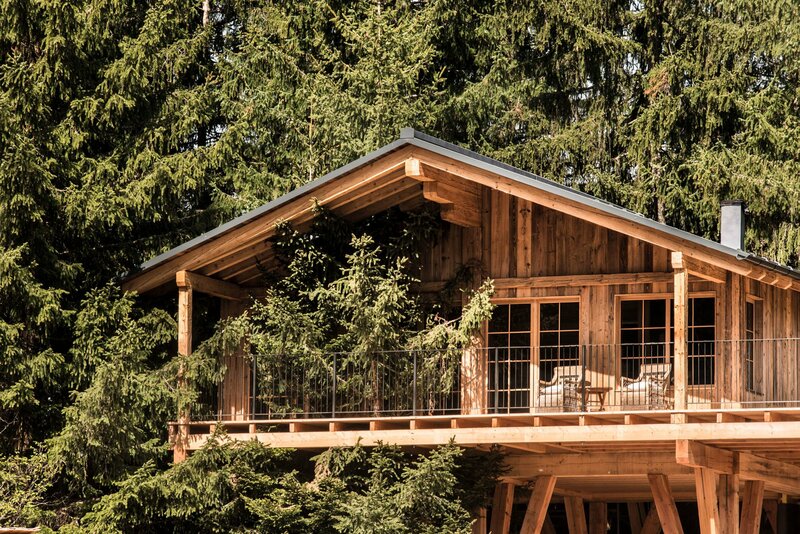 The complex includes both chalets and treehouses, offering different vistas and experiences. Steeping inside, one can help but admire the décor in awe, a perfect match to the stunning views. An indoor swimming pool looks like it flows into the lake, while the glazed walls in the main socializing area make guests feel like they’re outside. Apart from admiring the landscape, guests can also enjoy spa treatments or use the hotel’s gym. And for those who prefer to stay outdoors instead of watching a movie in the in-house cinema, there are plenty of hiking trails waiting to take them into the heart of nature. Warm, rustic wood surfaces, elegant furniture and minimal contemporary touches create a space that strangely feels like home. Photography© San Luis Hotel.